Ariel O’Connor, a 2009 graduate of Buffalo State’s Art Conservation program, was featured in an article in the Washington Post regarding her work on dioramas that compose an exhibition at the Smithsonian American Art Museum. O’Connor, who works as an objects conservator for the Smithsonian, spent three months at the office of the chief medical examiner in Baltimore, Maryland, restoring dioramas of crime scenes that were used to train generations of police detectives. 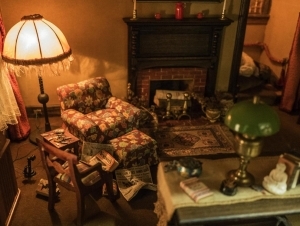 The exhibition, Murder Is Her Hobby: Frances Glessner Lee and the Nutshell Studies of Unexplained Death, will be on display through January 28.